The list of Sufferer Recommended US doctors has been updated (April 28, 2012), and a new list of Sufferer Recommended CANADIAN doctors is now available on the DOCTORS link on the left. We're still working on a new list of International doctors. CH is a rare neurological disorder, affecting approximately 0.1% of the population, which causes excruciatingly severe pain on one side of the head, usually centered around the eye. The pain is often described as boring, burning or stabbing and is often likened to someone plunging a red hot poker into the eye. The pain escalates very rapidly going from zero to debilitating in 5 to 15 minutes and stops as quickly as it starts. Attacks last between 15 minutes and 3 hours and can occur from once every other day to eight times per day, usually at the same times each day. One or more of several physical reactions accompany the pain, always on the same side as the pain. These include watery eye, runny and/or stopped up nose, red/bloodshot eye, a drooping eyelid, forehead and facial sweating and irritability. Unlike with a migraine, a sufferer usually cannot lay down during an attack. Instead, he or she will usually pace the floor, sit rocking back and forth, bang their head on the floor or wall, curse, scream and cry from the pain. It is with great sadness that the Board of Directors of OUCH is going to have to close the organization. Over the years OUCH has been a strong viable organization for the support and research into cluster headaches. Recently, membership interest has dropped, volunteerism is low and there is no apparent interest in serving on the Board of Directors. The current Board cannot continue alone, and per our by-laws, and with no membership support or volunteers for office, we must close the OUCH doors. Over the years of OUCH’s existence, there have been many people who have given their time and dedication to not only OUCH, but to cluster headache support and research. We want to thank each and every one of you for your support. We are working with the State of Texas, where we are registered as a 501c non-profit corporation to close down according to Texas laws, as well as filing our closure with the Internal Revenue Service. Both our checking account with Bank of America and our PayPal account will be closed and all remaining funds will be donated to ClusterBusters which is a registered 501c non-profit organization, as well as other organizations devoted to cluster headache research and support. If you are an active registered member of OUCH, please go to the OUCH message board at clusterheadaches.com and read our official announcement. We wish all of you well and to be pain free from cluster headaches. 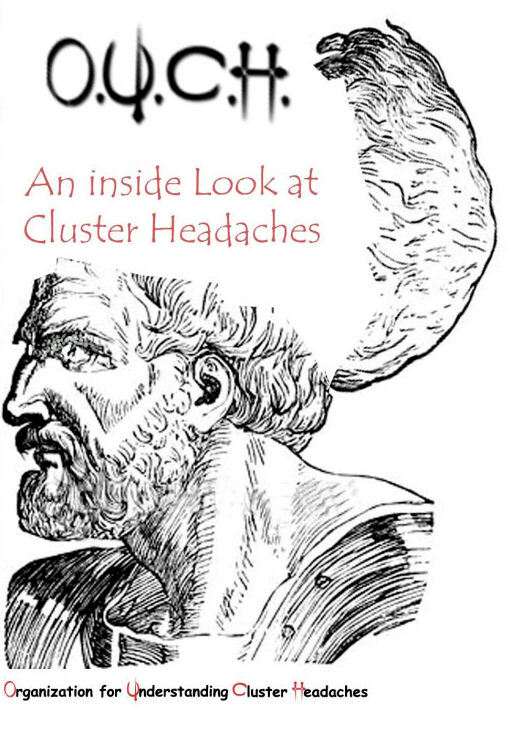 Please continue to visit clusterheadaches.com and clusterbusters.com for their wonderful information and support. It hurts us dearly to have to do this but we have no options. The Organization for Understanding Cluster Headaches (O.U.C.H.) is a 501, c, (3), nonprofit organization, formed to assist cluster headache sufferers and their families (supporters). O.U.C.H. was formed and is operated by cluster headache sufferers, supporters and others strictly on a volunteer basis..
Our mission is to provide information and emotional support to cluster headache sufferers throughout the world. We encourage, support and participate in research to develop new and improved therapies and practices for treating cluster headaches. We conduct annual conferences, attended by members from all over the world. We establish communication with the medical, research and pharmaceutical communities to further the understanding of sufferers' needs and to encourage improved diagnosis and treatment of cluster headache. We try to gather, on this web site, all pertinent information which may help sufferers better understand and deal with their condition. DISCLAIMER: The information provided on this web site is for educational and informational purposes only. It should not be used as a substitute for seeking professional care or for the diagnosis and treatment of any medical disorder. O.U.C.H. makes no claims as to the scientific/clinical validity of the information on this site OR to that of the information linked to from this site. All information taken from the internet should be discussed with a medical professional! O.U.C.H is a group of dedicated volunteers who are both sufferers of cluster headaches and supporters of loved ones with cluster headaches. All information found here is lovingly compiled and maintained to help those who suffer with this disorder. If you can help, either with your volunteer time or with a donation to O.U.C.H, your contribution will be greatly appreciated. ©1998-2012 O.U.C.H All rights reserved. Some information on this site is protected by international copyright laws. You may not re-distribute any copyrighted information on or linked to from this site without written permission from O.U.C.H, the webmaster of this site and/or the original copyright holder.